We talk a lot about the need to bring positive energy when communicating. Gestures, facial expression and vocal variety all enhance the sense of passion and enthusiasm coming from a presenter. Beto O’Rourke seems committed to bringing great energy to his stump speeches and announcements. But sometimes a presenter can overdo the gestures. In this particular case, the critique from Trump and others is absolutely on target. His arm and hand gestures are quite distracting, and he points way too often. How can we tell his gestures are over the top? Let’s start with a bit of data analysis. Watch his announcement of his candidacy. We counted at least 75 separate arm and hand gestures in the first minute of his talk, all while his wife Amy kept her hand in the crook of his arm as if to help minimize his movements. 75 gestures per minute—some birds don’t even flap their wings that often when flying south for the winter! Gestures become distracting when they look forced, seem unnatural, or are used repeatedly. And Beto’s style covers all three.Connecting with potential supporters is hard to do when some are paying more attention to his gestures than his words. We can only guess how SNL might depict him on their next live show, but Jimmy Fallon has already gotten things started. We’d encourage O’Rourke vary his approach. His energy is impressive, but he doesn’t need to emphasize every single syllable. From what we’ve seen so far, he’s naturally an engaging speaker, but he’d be more effective by occasionally toning it down, pausing for impact and lowering the volume. At 6’4”, with long arms and very long fingers, Beto faces the same challenge that many tall people deal with when they speak in public. Long arms take up a lot of space. Add to that the fact that, so far at least, he seems to like to stand on top of tables or chairs to deliver his stump speech, and you have oversized, distracting movements. Like many other presenters, Beto needs to make adjustments to accommodate his physical stature. 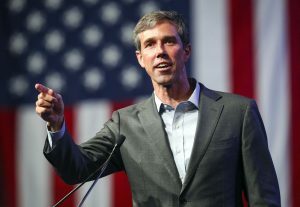 As Beto O’Rourke’s presentation trainers, we’d work with him to explore ways to use his hands more selectively, to practice more subtle gestures that might work better for him, or to use different techniques to express his energy. He might even try putting a hand in his pocket. If you know any of Beto’s people, kindly have them call us!